These Accu-Tab chlorinators are a few of the many models designed for use in potable water and wastewater treatment applications. View all municipal options. Today's potable water and wastewater treatment facilities face a multitude of complications in the goal to provide clean, safe water to communities. Slashed municipal budgets, government regulations and the need for complex risk management plans challenge facilities every day. 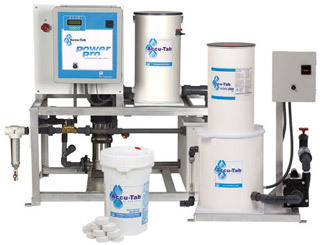 As facilities reassess their water treatment systems, many find the solution in the Accu-Tab® tablet chlorination system. The Accu-Tab system combines specially-engineered chlorinators with controlled-release 68% three-inch calcium hypochlorite tabs to deliver consistent and controllable chorine residuals. This reliable chlorination solution involves a low capital investment that has proven to be more efficient than chlorine gas or bleach. And, unlike chlorine gas and bleach systems, the Accu-Tab system reduces the risk of leaks and requires no expensive safety systems—just rubber gloves and safety goggles are needed to handle chlorine tablets. As proven in thousands of installations worldwide, the Accu-Tab system is used in drinking water applications for primary treatment or remote booster stations. It is a cost-effective solution to chlorinate small-to-medium sized water plants and is the right solution for well water and ground water disinfection as well as a variety of municipal and on-site wastewater treatment systems. 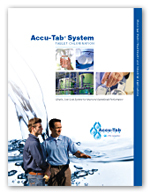 Accu-Tab systems are certified or registered by the NSF, USDA, AWWA, FDA and EPA. How does the Accu-Tab system meet drinking and wastewater treatment needs? Use the image buttons above to learn more on the application pages. Or, download a capabilities brochure (PDF) on Municipal Water & Wastewater. Accu-Tab® calcium hypochlorite tablets are designed specifically for use in Accu-Tab chlorinators and should not be mixed with any other chemicals, including any other pool chemicals. Do not add calcium hypochlorite tablets to any dispensing device containing remnants of any other product or pool chemical. Failure to comply could cause malfunction and will void the warranty as well as NSF certification. More seriously, the mixing of incompatible chemicals may generate heat, release hazardous gas and potentially cause a violent reaction leading to fire or explosion. In addition, tablets from different labeled buckets should never be mixed. Operators of any Accu-Tab system should thoroughly read and understand label directions that accompany the chlorinator and tablets before operating the system. See how easily an Accu-Tab system installs into a municipal water/wastewater treatment environment.